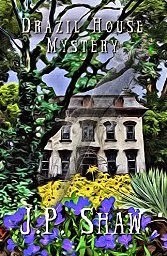 Drazil House Mystery by J.P Shaw is an e-book for the younger novel reader. It will soon be released in paperback. Jennifer purchases a locket from the local flea market which soon leads her and her friend Hanna on a treasure hunt. The locket contains a piece of parchment paper which holds hidden clues. The characters within the book are all lovely and sweet. They have a nice demeanour about them. There is dad’s new girlfriend that Jennifer is having trouble relating to and the respected and loved grandma who Jennifer is able to go to for advice since mum is no longer there. These are issues that the younger reader may relate to and which may open them to talking to the adults in their life. This book had its up and down moments for me. At times I was enjoying my journey wondering what was around the corner and at other times I was bored and wondering if I could continue reading. I also found it jumped from one thing to another too quickly with no descriptive language in between. Drazil House Mystery was just a read, not a journey. I would have liked to have seen more strength in the characters. For myself the book overall was too weak. From what I can find online this is the first book by J.P Shaw. I could not find a website or any information on her as an author. The only link found was that of Amazon. J.P shaw lacks the strength of a good storyteller. She can write in the sense that the book flows, is well written and readable but there is a clear difference between a writer and a storyteller which draws you in and has you breathless with each word. I look forward to watching the professional growth of J.P Shaw as I feel with practice she shows the ability to produce a strong read. This book is based around 12 year olds but I wondered if it presented as a little immature for the 12 year old of today. It reminded me of a weaker version of the older style books such as The Famous Five or Nancy Drew which, although still well known, have dated with the younger readers of today’s generation. Maybe I am just getting old but as a reviewer of books for all ages Drazil House Mystery by J.P Shaw just did not grow on me. If you have an early teen who loves to read e-books give it a go and let me know how you find Drazil House Mystery by J.P Shaw. This review is my personal opinion only. Books are a personal choice and journey. Drazil House Mystery was just not for me.